It makes such a nice change to see a DL shaped card Val and the flowers are super. Great card Val. I agree with Chrissie; it's lovely to see a DL card. Beautiful, elegant card, its a super image. 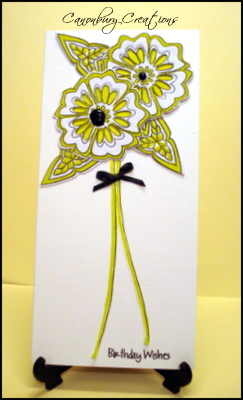 Val, you did a great job with the colour combo, your card is very stylish and elegant! Thanks for all your kind comments on my blog, you're a star!! Hi Val this is a great card and a great ideo, so lot of work behind, fabulous. you do DL cards so well, val!! your bouquet is gorgeous!